What a great time of year! The New Year brings refreshed hopes and dreams to us all. This is the perfect time of year to teach children about the passing of an old year, new beginnings and New Year's Resolutions. Use these crafts in your classroom, as additions to your lesson plans or simply in celebration of the New Year. The children will love taking what they learned home to celebrate the holiday with their own creative crafts! 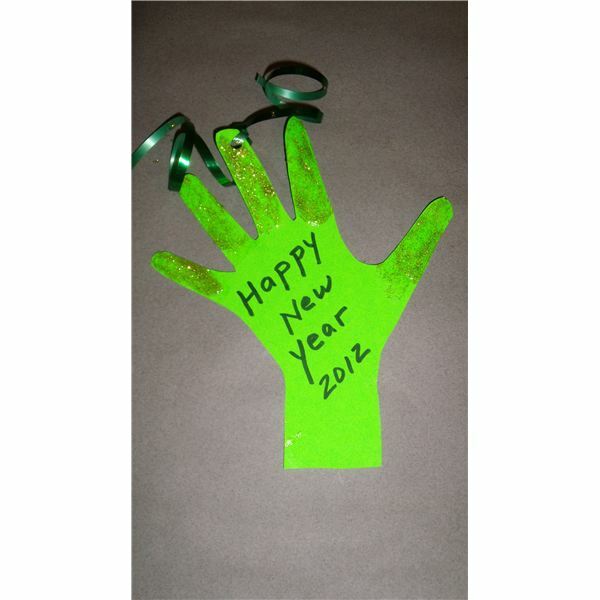 Go green this New Year with this “green” confetti and make an environmentally friendly choice to protect our world. Even on a preschool level, being environmentally conscious is a topic that comes up through the common practice of reusing old materials. Discuss with your students how important it is to be "green." Look around your classroom and as a class decide what can (or cannot) be used as confetti. Typical choices could be old magazines, scrap paper, and newspapers. Using safety scissors, the children could cut the paper up into 2 inch pieces of confetti. Make them larger than typical confetti pieces, because this confetti will be used again and again. Some children might need help with scissors, or they can simply tear each piece. Once enough confetti has been gathered, have the children make a confetti holder. This is simply a piece of paper. Again you could use recycled paper found around the classroom as long as it is standard in length. Have the children decorate this holder in the spirit of the New Year, and make sure the date is included. Once these holders are decorated, form them into a cone and tape them so they can hold the cone shape. Place confetti into this cone leaving some room at the top. After the confetti has been added, fold over the top of the cone to cover the confetti, and “hold” it for a later celebration time. Practice counting down from 10, and watch your students go wild as they are told it is OK to open the holder and toss the confetti into the air. Have them pick up the mess together, place it back into their holders, and then count down again! The New Year is a time for new hope to spring, and now is the perfect time to teach about New Year’s Resolutions. Trace your preschooler’s hands on any type of stock paper. Either you or the child could cut out this hand depending on skill level. On one side of the cut-out hand you can write Happy New Year and the date. On the other side you can put their resolution and let the child sign their name. As a class, brainstorm some ideas adding some of your own to commence the process. Common ones include: Be more polite, share my toys with my sister (brother), learn to tie my shoes, learn to count to 20, choose healthy snacks, etc. Ask the students individually what they would like to accomplish in the New Year. On the hand ornament state, “In (year) I will _____,” then write down what the student says. When the paper hand is completed punch a hole at the top of the middle finger and tie a string through so that it can be hung. Ask your students to place it in an area where they are most likely to be reminded of their New Year's resolutions throughout the year. Teach your students what a time capsule is and how they can create one of their own. Ask your students to bring in a shoe box or empty coffee can, or have them available for your students. Each student will need their own container or “time capsule.” In addition to the capsule, ask the students to bring in three items or more of things they would like to place in the time capsule. Items can include pictures, books, toys, etc as long as it will fit within the box. Inform your students that they will not be seeing these items until the end of the year. You may need to send a note home to the parents informing them of this upcoming time capsule craft and requesting several items, so they can help the children decide on what to place into the capsule from home. Have the students decorate their time capsule in any way you see fit. Make sure you include the date of the New Year, which will be the date that these time capsules will be “sealed.” At the end of the year have a “grand opening” at which each student will have a turn to open their time capsule. Even though the end of the year is only months away, in the mind of a preschooler this could be an eternity. Watch your little ones joyfully reunite with forgotten or missed objects of affection! These New Year’s Eve crafts are a sure-fire hit for any preschool classroom, New Year-themed lesson plan, or celebration. Plan ahead and you will be ready for the New Year in no time!